Solar Powered Hornets - A New Source for Bioenergy? Solar Powered Hornets – A New Source for Bioenergy? That yellow stripe on the Oriental Hornet is nature's solar panel. Harvesting sunlight for energy isn’t just for plants anymore. Scientists in Israel and the UK have discovered that the Oriental Hornet (Vespa orientalis) has a special ‘solar panel’ that it uses to convert light into usable energy. The extra boost of energy the hornet receives may be why the insect correlates its nest-building activities with the intensity of the sun. 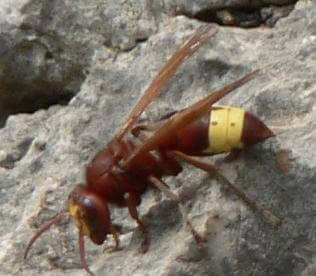 A study of the hornet, and its solar panel, was recently published in the journal Naturwissenschaften. Researchers now have a new understanding of the special pigment, xanthopterin, the hornet contains in the yellow solar panel part of its body. This opens new possibilities in energy collection – there’s another biological option for solar power besides chlorophyll and photosynthesis. Oriental Hornets and xanthopterin are extraordinary examples of the surprises that nature has yet to show us in energy, genetics, and zoology. There’s little doubt that the hornet has evolved to take advantage of solar power. The yellow stripe on its abdomen not has a different primary pigment than the rest of its body (xanthopterin vs melanin), and the cuticle (external layer) of the insect has a light affecting structure as well. Remarkably, some layers in the cuticle display the properties as a diffraction grating, helping to trap and contain light! By reflecting some colors of light and trapping others, the solar cuticle helps to provide as much light energy to the xanthopterin particles as possible. This animal’s body is nature’s equivalent of a well designed solar cell. Why it needs that design isn’t exactly clear. It’s still very early in the research process, and the study in Naturwissenschaften isn’t able to explain the exact biochemical process that transforms sunlight into energy the hornet can use. It does look like a good part of the insect’s metabolic functions are centered around the solar panel section of its body. Authors of the study hypothesize that the xanthopterin could be assisting or accelerating the metabolic process in the hornet’s cells. No matter how the insect uses it, the very fact that there is an animal that harnesses sunlight is rather astonishing. Sure, many creatures use solar heating to help them control their body heat. Oriental Hornets, however, are actually translating light energy into usable electrical/chemical energy. That’s in a league of its own. While the structure of the insect’s cuticle in the yellow solar panel section is probably not very useful to us, xanthopterin could be. The scientists studying the Oriental Hornet constructed a dye-sensitized solar cell to demonstrate the effectiveness of the insect’s conversion of light to electrical energy. In the words of the authors, the xanthopterin powered solar cells “provide a technically and economically credible alternative concept to crystalline silicon-based p–n junction photovoltaic devices.” That is to say, we could use xanthopterin as an alternate way of building solar panels for humans. So there’s at least the possibility that xanthopterin could provide new avenues of attack for solar energy. It could also have implications in bioengineering. If the genes for xanthopterin production can be found it would give biologists another tool to help them engineer microorganisms that can convert solar power into chemical or electrical energy. That could have a big impact in biofuels, cybernetic implants, and many other fields. Clearly it will be many years before scientists would be able to turn this discovery towards practical applications. Still, knowing that nature has probably provided another means of converting light into chemical or electrical energy is pretty exciting. Unexpected finds like this one are why science is so addictive. I can’t wait to see what other secrets are out there, waiting for us to stumble upon in the years ahead.